This little-known company has piled up 24 consecutive quarters of year-over-year revenue growth. After long being rumored to be getting more involved in healthcare, Apple (NASDAQ:AAPL) made it official in mid-September by announcing that the latest Apple Watch will support cardiac health monitoring apps and wrist sensors. The U.S. Food and Drug Administration has cleared both (the watch is not a Class III medical device, so only FDA clearance is required and not FDA approval) for helping individuals record cardiac data that can be presented to their doctors. It builds nicely on one of Apple's first big, publicly known splashes in healthcare: the Apple Heart Study, which aims to screen for heart rhythm abnormalities known as cardiac arrhythmias using the Apple Watch and iPhone. Oh, and one more piece of hardware: the ePatch -- a simple, cableless cardiac sensor placed on a patient's chest (a location widely considered to result in more accurate data collection compared to wrist-based sensors) for recording electrocardiographic data -- from BioTelemetry (NASDAQ:BEAT). The company is not very well known and is relatively small, sporting a market cap of just $2 billion, but it has piled up a pretty impressive resume that includes 24 consecutive quarters of year-over-year revenue growth. Investors that dig around might find more to like, especially from the perspective of a tech-savvy company such as Apple that's looking for a path into a notoriously difficult space. Could BioTelemetry be the key to the tech giant's healthcare strategy? BioTelemetry, as it exists today, was built through multiple acquisitions, some small and some large. While that makes for a somewhat complex operating structure with multiple subsidiaries and a product portfolio with one foot in the past, the business has thrived so far. The company's latest splash came in July 2017 with the $283 million cash and stock acquisition of LifeWatch that, at the time, management said created the "largest and most profitable connected health platform." The two companies had a lot in common, so the acquisition created scale and cost efficiencies in everything from product development to customer relationships to contract negotiations. It also combines two of the leading tech platforms, in both software and hardware, in the fledgling market of remote cardiac monitoring services. Management decided that record performance in the second quarter of 2018 justified raising guidance. The company now expects full-year 2018 revenue of $393.5 million and an adjusted EBITDA margin of approximately 26%, up from original estimates calling for $380 million in revenue and an adjusted EBITDA margin of at least 24%. While the acquisition injected immediate growth into the business, BioTelemetry is eager to leverage its wireless platform to break into the emerging opportunity in consumer applications. That's where the Apple Heart Study comes into play. Apple wants to get into healthcare. Is BioTelemetry the ticket? The idea of the Apple Heart Study is to combine the iPhone, Apple Watch, and BioTelemetry's ePatch to screen for heart rhythm abnormalities in the general population. The cardiac monitoring leader will also provide data analysis and reporting services to ensure the raw data from the ePatch are delivered to the Apple Watch. It's important to note that a "screening tool" is very different from a "diagnostic tool" (which faces stricter regulations), and Apple is careful to make the distinction. That doesn't make it any less valuable. Considering the scale and distribution of the two consumer products, the data collected could prove valuable for quantifying the incidence rates of various cardiac events and encourage individuals without symptoms to see their doctor if abnormalities are discovered. Yet while BioTelemetry brings domain knowledge that Apple itself lacks, it's still much too early to draw any conclusions about the direction of the relationship once the Apple Heart Study concludes. For one, the ePatch is a relatively simple device (it was acquired for just $3 million). It also faces a rising tide of competitors that may have better technology. For instance, iRhythm Technologies (NASDAQ:IRTC) offers the Zio XT and Zio AT smart patches for wireless cardiac monitoring, has been growing revenue in similarly astounding fashion as BioTelemetry, and is also valued at north of $2 billion. It offers a more user-friendly, tech-savvy consumer experience than the relatively bulky products from BioTelemetry. It also sells just two products, which may make for a more attractive and less bloated product portfolio in the eyes of major tech companies circling the healthcare arena. While getting involved in the Apple Heart Study is a big deal on the surface, investors shouldn't necessarily think that BioTelemetry is a shoo-in for future work with Apple. The digital health space has drawn some serious competitors, and there's no reason to think the tech giant couldn't design something of its own that better integrates with the Apple Watch. It tried to build a car, after all. That said, even if investors evaluate BioTelemetry without factoring in the Apple Heart Study -- the financial impact of which is still unknown, by the way -- then the business could be worth a closer look. 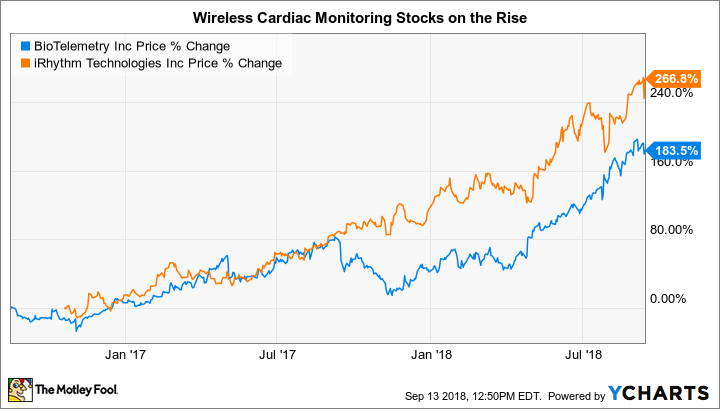 A growing opportunity in cardiac monitoring has led to rising profits and cash flow, which could provide flexibility to expand its efforts in other health applications. Just remember, there's a healthy amount of competition that could erode the company's first-mover advantage.